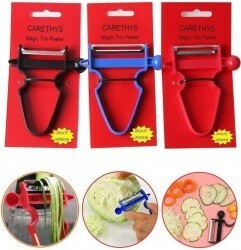 EFFICIENT: This magic trio peeler set will cut your prep time in HALF! SAVING you TIME, EFFORT and ENERGY. They also let you create new WONDERFUL dishes so you can now ENJOY eating your veg again. BLACK 50mm PEELER: General Peeling potatoes, carrots, apples, pumpkin, pineapples, tomatoes. BLUE 68mm PEELER: Cabbage shredder, cheese slicer, ribbons, thin slicing. RED JULIENNE PEELER : Julienne, zucchini noodles, pumpkin spaghetti.